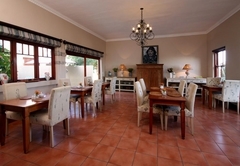 Lavender Manor Guest Lodge is a 4 star graded B&B offering Hermanus accommodation in 9 guest rooms. 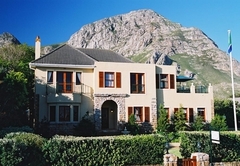 Lavender Manor is the ultimate owner managed luxury guest house which offers spectacular sea and mountain views and warm, relaxed hospitality. 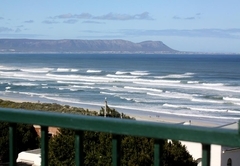 Overlooking popular Grotto Beach and the whale sanctuary of Walker Bay, you are within two minutes walk of the magnificent beaches and the famous scenic cliff path. 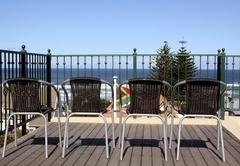 Relax next to the cosy pool area, enjoy a refreshing drink at the fully licensed sea view pub, or watch the incredible sunsets over the ocean from the upstairs patio and sundowner decks. 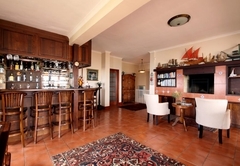 Ideally positioned for magnificent whale watching, exploring the walking trails in the nearby nature reserve, visiting the different wine routes and near two world class golf courses. A large secluded garden and secure off street parking is complimentary. See and hear the waves break on the beach and nearby rocks and watch the whales play in the bay. Our guests leave happy! 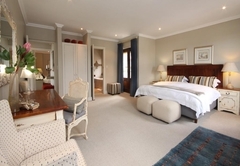 Luxury sea facing room with en-suite bathroom, queen bed and private Romeo & Juliet balcony. 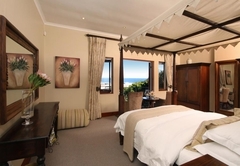 This room offers spectacular sea views and stunning whale watching from the comfort of your room. Relax in your bed and watch the whales play in the bay. Honeymoon suite. Satellite TV, beverage facilities, mini bar, safe, percale linen, free WiFi, safe parking and all upmarket comforts. Breakfast included. Luxury mountain facing room with en-suite designer bathroom, twin or king bed and a large private wooden patio with spectacular mountain views where you can enjoy the tranquillity and soak up the sun. Satellite TV, beverage facilities, mini bar, safe, percale linen, free WiFi and all upmarket comforts. Breakfast included. 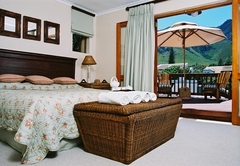 Stylishly decorated luxury sea and mountain view room with twin or king bed and en-suite bathroom. Extended bay window area overlooking the mountain, and a private balcony with stunning views of Grotto beach. Satellite TV, beverage facilities, mini bar, safe, percale linen, free WiFi and all luxuries. Breakfast included. 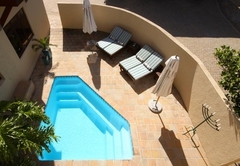 Tastefully decorated standard garden room adjacent to the pool with twin or king bed and en-suite bathroom. Extended bay window area with private entrance. Wheelchair friendly. Satellite TV, beverage facilities, mini bar, safe, percale linen, free WiFi, safe parking and all upmarket comforts. Breakfast included. 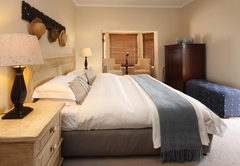 Stylishly decorated luxury sea view room with twin or king bed and spacious en-suite bathroom. 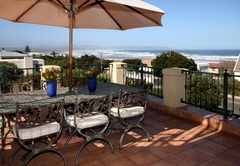 Balcony with magnificent views of Walker Bay and the beach. Watch the whales and dolphins play in the bay. Spacious and very comfortable. Honeymoon suite. Satellite TV, beverage facilities, mini bar, safe, percale linen, free WiFi, safe parking and all upmarket comforts. Breakfast included. 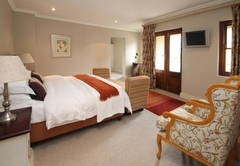 Tastefully decorated luxury mountain facing room with twin or king bed and spacious en-suite bathroom. 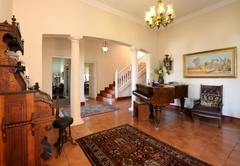 Private balcony with great views of the majestic mountain backdrop and Fernkloof Nature Reserve. Satellite TV, beverage facilities, mini bar, safe, percale linen, free WiFi and all upmarket comforts. Breakfast included. 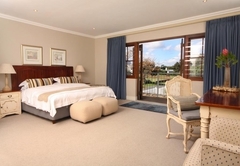 Stylishly decorated luxury sea and mountain view room with twin or king bed and full en-suite bathroom. Two balconies, one with stunning views of the magnificent mountain backdrop, and the other of the whale sanctuary of Walker Bay. Spacious and very comfortable. Satellite TV, beverage facilities, mini bar, safe, percale linen, free WiFi, safe parking and all upmarket comforts. Breakfast included. Tastefully decorated standard garden room with twin or king bed and full en suite bathroom. Spacious & comfortable private undercover garden patio. Satellite TV, beverage facilities, mini bar, safe, percale linen, safe parking and free WiFi. Breakfast included. 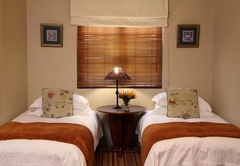 Comfortable standard family suite tastefully decorated with one double and two single beds in two interleading rooms – no door between the rooms. En-suite bathroom (shower in bath). Ideal for a family of 3 or 4 (two adults and one or two kids 6 to 16 years of age). Air conditioner, satellite TV, beverage facilities, mini bar, safe, percale linen, safe parking and free WiFi. Breakfast included. Overlooking the bay where the whales come to play you'll discover the unique attraction that Hermanus holds: the magnificent beaches, breathtaking mountains, scenic cliff path, fine South African cuisine, friendly locals, champagne air, great white sharks, whales and more whales - and stunning sea and mountain views forever. 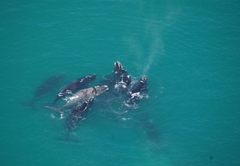 Come and experience why Hermanus is regarded as the Riviera of the south, and the whale watching capital of the world. Your hosts at Lavender Manor invite you to come and experience spectacular sea views and warm hospitality. 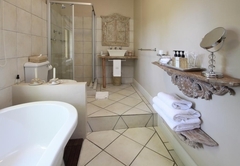 Luxury suite with stunning en-suite bathroom (bath & shower), queen bed and sea facing balcony. 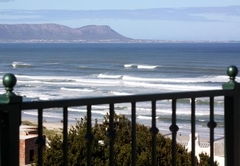 Spectacular sea views and whale watching from the comfort of your room and balcony. Ideal honeymoon suite. All upmarket luxuries. First floor. 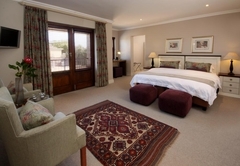 Beautiful suite with spacious en-suite designer bathroom (bath & shower), twin or king bed and large private wooden patio with spectacular mountain views where you can enjoy the tranquillity and soak up the sun. All upmarket luxuries. First floor. 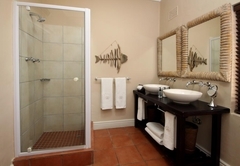 Stylishly decorated sea and mountain view suite with twin or king bed and luxury en-suite bathroom (bath & shower). Private balcony with stunning views of the ocean and Grotto beach. All upmarket luxuries. First floor. 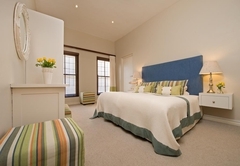 Stylishly decorated garden room with twin or king bed and en-suite bathroom (bath & shower). Spacious room and extended bay window area with private outside entrance. All upmarket luxuries. Ground floor. 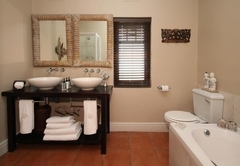 Stylishly decorated, spacious sea view suite with twin or king bed and luxury en-suite bathroom (bath & shower). Private balcony with magnificent views of the ocean. Watch the whales play in the bay. All upmarket luxuries. First floor. 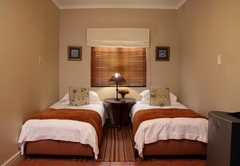 Spacious, tastefully decorated mountain facing room with twin or king bed and full en-suite bathroom. 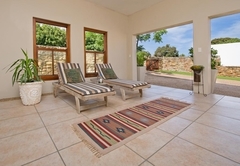 Private balcony with great views of the majestic mountain backdrop and Fernkloof Nature Reserve. Listen to the baboons All upmarket luxuries. 1st Floor. 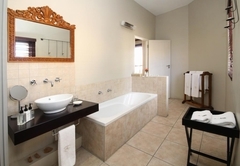 Stylishly decorated, spacious sea and mountain view suite with twin or king bed and full en-suite bathroom (bath & shower). Two private balconies, one with lovely sea and the other with mountain views. All upmarket luxuries. First floor. 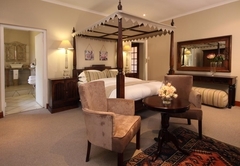 De luxe garden view room tastefully decorated with twin or king bed and full en suite bathroom. Spacious & comfortable private undercover garden patio. Air conditioner. All comforts. Ground floor. Outstanding stay! Loved every minute of our stay at this above average hotel. excellent service, great location and wonderful atmosphere. thanks, we hope to come back one day. Response timeLavender Manor Guest Lodge typically responds to requests in 5-10 minutes. Child policyChildren 12 years and older are welcome, unless by prior arrangement.